Do you have a sick canary? Would you know an ill canary if you saw it? Before you can wage war on the enemy--canary sickness--you have to know what the enemy looks like. Understanding symptoms of a sick canary may be the most important thing you can do for your pet bird. The symptoms listed below are the traits and mannerisms of an ill canary. It's difficult to get specific about what sickness your canary might have though. It's like when YOU have a fever, headache, and chills, you don't really know whether you have a virus or bacterial infection or if the chili dog you had for lunch was a under the convenience store's heat lamp to long (I speak from experience on that one). Once you discover that your canary is feeling under-the-weather there are things you can do to make him feel better and help him fight off the illness...regardless of whether or not you know the cause. So it’s important to keep an eye out for the warning signs. BUT FIRST, to make it easier to recognize the symptoms of a SICK canary, it's important to know the appearance of a healthy canary then compare the two. "A healthy canary is a nimble, cheerful bird with tight plumage, bright eyes, a hearty voice, and a healthy hunger!" loose or fluffed up feathers would be a sign of a sick canary. loss of appetite you'll know something is wrong. ...Antibiotic, enzyme replenisher, and vitamins. This ensures that when your canary acts sick you'll have some important medicines on hand--this is not the time to make a run to the pet store--every minute counts. See below for more detailed treatment information. Respiratory infection, intestinal distress, a bad diet, or even a fatal disease. This sketch is from The Canary Handbook, a good book for canary owners and goes hand in hand with the CANARY BIRD LISTENING ebook...a must have! CANARY POOP SPEAKS TO ME. Your canary's droppings are talking to YOU too. Do you know what they're saying? Are you listening? ...for your canary are available with CanaryTips! E-zine. CanaryTips! 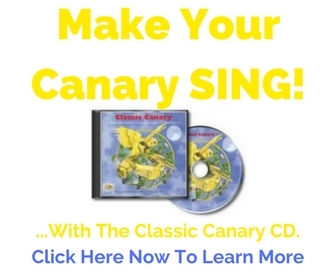 is THE premiere canary care e-zine. Sign up now. Yes, you can unsubscribe anytime. If CanaryTips! is not as helpful as I say...just a click of your mouse and you're off the list. Seriously, do it. It's one of the best things you can do for your canary's well being...and it'll be good for YOU too. "OK...So what do I do if I see some of these symptoms?" Good question...I'm glad you asked. The first thing you should do with a sick canary is make him comfortable. I'll show you how. Remember...he feels terrible! Once you have your canary comfortable you can start giving him some medicines that will make him feel better and hopefully CURE him. On this next page you'll discover how to make your sick canary comfortable and then we'll talk about the three medicines you should have on hand AT ALL TIMES....Click here to go there now. Canary Illness: How my canary returned from the "dead". Return from Sick Canary: Symptoms to CanaryAdvisor.com Home.